Dramatically improved surveillance technologies enable powerful states more effectively and accurately to determine the location, numbers, and motivations of actors they deem to pose security threats. Weapons technologies and delivery systems have also improved, enabling greater precision in targeting and less collateral damage. 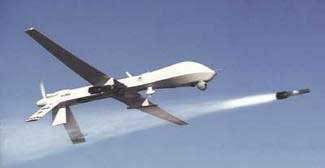 And the development of increasingly sophisticated unmanned aerial vehicles – a category that includes drones – not only assists with intelligence-gathering and precision-targeting, but also eliminates any immediate risk to the military or intelligence personnel who control them. ► Can be used without posing any risk to their operators, who remain safely far from the strike zone. The availability of technologies that are cheaper, create no risk that one’s own personnel will be harmed, and that reduce the potential for significant civilian deaths (thus reducing the odds of international condemnation), seems likely to make states more willing to use force. That likelihood poses a challenge to the collective security structures created by the U.N. Charter. States frequently have strained at the Charter’s rules on the use of force. Nonetheless, they have hesitated directly to confront the Charter framework, and that framework so far maintained a fragile integrity. This may be in the process of changing. The rapid evolution in technologies has paralleled another – the rapid evolution of doctrines limiting state sovereignty. As discussed in yesterday’s post, sovereignty-limiting theories such as responsibility to protect and the prevention of terrorism – though one comes from the human rights community and the other from the national security community – are structurally parallel. Each insists that under certain circumstances, external actors may intervene in a state’s “internal” affairs without the state’s consent, and quite possibly without the consent of the Security Council. When such sovereignty-limiting theories are available to states that seek to justify uses of force that exceed the narrowly interpreted confines of the U.N. Charter, the perceived reputational costs of using force inside the borders of other sovereign states will go down. Combine these normative and doctrinal developments with technological changes that reduce the financial and human cost of using of force inside other states borders, and the threshold for using force will get lower still. Proponents of R2P and counterterrorism-based sovereignty-limiting theories thus need to acknowledge that both directly challenge the UN Charter’s collective security framework. This may not be a bad thing: the world we live in has changed substantially since 1945, both in terms of widely shared normative assumptions and in terms of technology and risk. ► Begin the difficult project of developing new rules and institutions to preserve peace in this new era. If we don’t, we risk a return to the Hobbesian international order that the Charter was designed to eliminate.